Former Italy defender Giuseppe Baresi has enjoyed significant success with Inter but winning the treble as Jose Mourinho’s right-hand man in 2010 was the defining moment of his footballing odyssey. The presence of a man who has devoted virtually his entire life to Inter, first as a player and then as a key member of their coaching staff, will have evoked many happy memories for the legions of Nerazzurri fans in Malta. Giuseppe Baresi is Inter through and through. He can be described as a one-club man as, bar a short spell with Modena in the final years of his playing career, Baresi has always represented Inter, spending almost 20 years with the club as a player before holding various coaching roles. 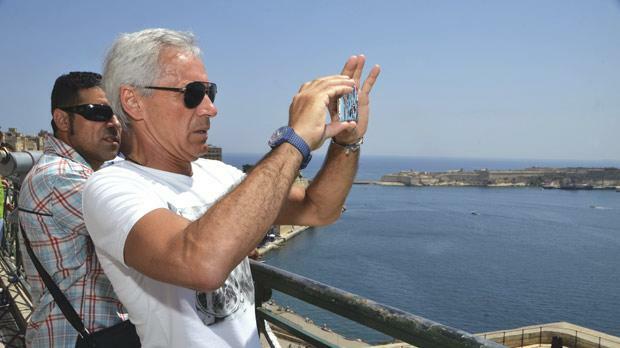 “Inter represent my second family,” the softly-spoken Baresi, who has just spent five days in our country as guest of the Inter Club Pupi Zanetti Malta, told Times of Malta. “My parents, brothers, sisters and relatives are my first family but Inter is my second home. During his long playing career, Baresi won two Serie A titles, two Italian Cups and one UEFA Cup. After hanging up his boots in 1994, he took charge of Inter’s youth sector and, in 2008, was appointed assistant to Portuguese coach Jose Mourinho. “I have worked in all sectors at Inter,” Baresi, 57, added. “I was a youth player at Inter for five years and spent 15 years with the senior team. “After moving into coaching, I had the satisfaction of winning a number of titles at youth level. Baresi has enjoyed many highs in his playing and coaching careers but his eyes glistened as he reminisced on the famous treble won by Inter in season 2009/10 when he was Mourinho’s trusted lieutenant. 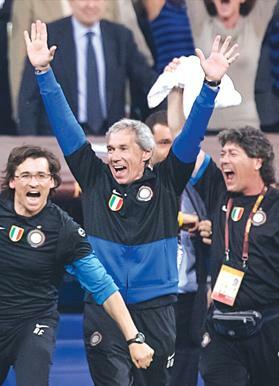 “La tripletta (the treble),” Baresi replied when asked to single out the best moment of his association with Inter. “The whole season was unforgettable. Working close to Mourinho, a coach with a great charisma, was an incredible experience. A smile settled on Baresi’s lips when I remarked that Juventus, Inter’s arch-rivals, came close to matching Inter’s treble feat last season only to fall at the last hurdle after going down 3-1 to Spanish giants Barcelona in the Champions League final in Berlin. “Inter and Juventus are big rivals,” Baresi remarked. “As an Italian, I back the Italian teams and the national side in international competitions. After winning the Serie A and Coppa Italia, Inter lifted the Champions League trophy at the iconic Santiago Bernabeu Stadium on May 22 after overcoming Bayern Munich 2-0 thanks to a brace from Argentine striker Diego Milito. No Italian club has reached the summit of European football since Inter’s triumph in 2010. Before Juventus’s march to the final last season, Serie A teams had generally struggled to keep the pace with their Spanish, German and English counterparts in the Champions League. This slump has been blamed on the diminishing standards of the Serie A which, in the eighties and nineties, was regarded as the world’s most glamorous league. Having witnessed this drastic shift at close quarters, Baresi said: “It was the players who made the Serie A the strongest league in the world in my playing years. “In that period, Milan had the Dutch players, (Ruud) Gullit, (Marco) Van Basten and (Frank) Rijkaard while Inter relied on the Germans (Karl-Heinz Rummenigge Lothar Matthaus, Andreas Brehme and Jurgen Klinsmann). There was Michel Platini at Juventus and (Diego) Maradona played for Napoli. “These players transformed the Serie A into the best league in the world but, in the last two decades, most of the top stars didn’t come to Italy. They went to Spain, England and Germany because the clubs there have more money. As a former youth coach, the development of young players is still very much at Baresi’s heart. While expressing his satisfaction that Inter, now spearheaded by Indonesian tycoon Erick Thohir, are putting more emphasis on their youth set-up, Baresi lamented the club’s failure to keep hold of former youth players like Leonardo Bonucci and Mattia Destro who ended up playing for Serie A rivals. “Inter are investing a lot in the youth sector and that is very positive,” Baresi reflected. “It’s not easy for youngsters to immediately establish themselves at clubs like Milan, Inter and Juventus unless you have a phenomenon like Mario Balotelli. “I believe that up-and-coming players should be sent on loan for two to three years but the clubs should be smart enough to identify those youngsters that have the potential to make the grade. “There are a few examples of players who have slipped through the net after coming through Inter’s youth system. Back in his playing days, Giuseppe was not the only Baresi to star in the Serie A as his younger brother Franco turned out for Milan. The story goes that Giuseppe and Franco Baresi both had a trial with Inter as teenagers but the latter went on to join their city rivals Milan where he became one of the club’s all-time greats. On the pitch, the two Baresi brothers became symbols of Inter and Milan but the rivalry between the two clubs didn’t tarnish their relationship. “The relationship with my brother Franco has always been very good,” Baresi said. The two brothers have essentially followed the same path as, after his retirement from football, Franco also continued to work for Milan. Beppe Baresi is no longer part of Inter’s technical staff under current manager Roberto Mancini but he’s still contracted to the club. His latest visit to Malta gave Baresi the opportunity to sample the untainted passion the local Inter supporters have for the club despite their struggles of late. “There is a lot of affection for Inter and there are a lot of supporters,” Baresi said. “To be honest, I didn’t know that there are so many Inter fans here. Malta is not far from Italy but at the same time, it’s a different country. “I enjoyed my time here. I had been to Malta many years ago when Inter played against Floriana (Cup Winners’ Cup) but on that occasion, I didn’t see much of the island.